Babblings of a Mommy: All Hail The Birthday Queen!! All Hail The Birthday Queen!! Today is my Birthday, and hey we all get to feel special on our birthday's right? So excuse the big head while I gloat on being Queen of the Day. Happy Birthday!!! Enjoy every nano second of being queen for the day! Happy Birthday...I hope you enjoy your day and that your family spoils you! Happy Birthday and enjoy being the queen of your castle. Make the kids bring you goodies, it's nice to see them scramble for something once in a while. Keeps 'em busy. Happy Birthday! I'm following for your birthday. :) lol. Thanks for the welcome on MBC. Happy Birthday to You!!!! 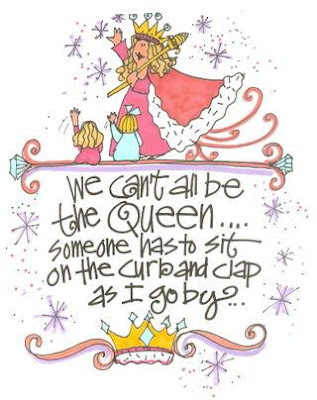 Enjoy your queenship today M'lady! Happy birthday! I LOVE the picture. What a riot!!! Happy B-day. Hope ya got lots of those VISAs. Bring on the cake!!!! You deserve it!! HAPPY BIRTHDAY!!!!! Hope you have a super duper day!! Happy birthday!!!! Okay, this post alone made me lol so much, I'm adding you to my blogroll. Thanks for the smile, and thanks for welcoming me to MBC. I'm sending you a blog award. Pop over to pick it up if you like. Oh!! Happy Birthday to u!!! Happy birthday to the queen!! Happy Belated Birthday! Hope you had a fabulous birthday!